Oysters can be eaten year round. There is an old wives tale that says you should only eat oysters in months that have a “r”. in them. This a myth. Oysters live in groups which are referred to as beds or reefs. Oyster reefs are very beneficial. Many small marine creatures both plant and animal make their homes in the areas around the oysters. These small creatures will in turn attract larger marine life to the area. Oysters are harvested in different ways depending on the depth of the water in which they live. Oysters that live in shallow water are harvested using small rakes or by hand. Special tongs can be used to harvest oysters in deeper waters. In extremely deep waters divers may be used. In the past dredging was a common practice. This process is rarely used today because of the damage that it does to the ocean floor. Edible oysters belong to the family ostreidae. Pearl producing oysters belong to the family pteriidae or feathered oysters. The largest member of the pteriidae family is the pinctada maxima. These osyters can reach over 8 inches in diameter. There are two kinds of pearls, cultured and natural. Natural pearls are very rare and are far more valuable than cultured pearls. Cultured pearls are made by implanting a foreign substance into the oyster. Oyster are very nutritious. You only have to eat 4 or 5 oysters to get your daily requirement of iron, calcium, zinc, copper, manganese, iodine and phosphorus. They also contain vitamins D, C, B1, B2 and B3. Oysters are recommended for people who are on low cholesterol diets. 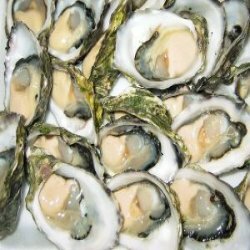 The Romans were known to have eaten oysters. It is even thought that oysters may have been consumed in prehistoric times. Tiny crabs are sometimes found living in oysters. These little crabs live in the gills of the oysters where they are protected by the oysters shell. They get their food by taking food from the water that the oyster filters. These crabs are considered to be a delicacy. This entry was posted in Animal Trivia, Food Trivia and tagged Eating Oysters, Oyster, Oyster Facts, Oyster Information, Oyster myths, Oyster Trivia, Oysters, Oysters Trivia by Jane. Bookmark the permalink.